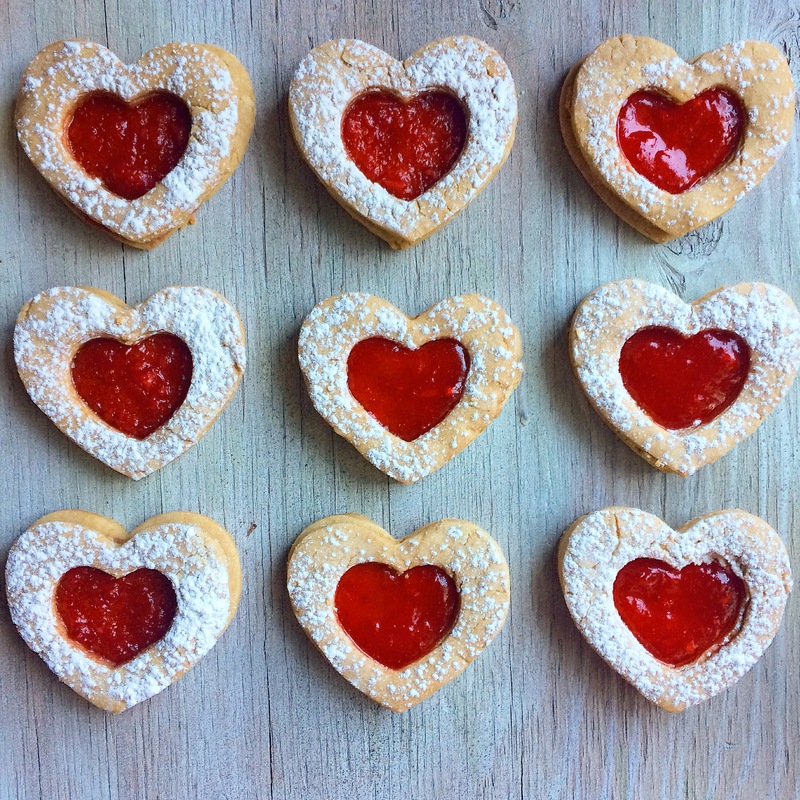 Slice and Bake Sugar Cookies with ALL of the fillings! After a few disastrous cookie decorating experiences, I vowed that my last sugar cookies of 2015 would be really low maintenance – aka no piping or pastry art required. Then I thought, do you even have to roll out the dough with this cookie recipe? What if we added fun ingredients to the dough instead of making frosting? Enter my fall-themed slice and bake sugar cookies – white chocolate, dried cranberries, candied ginger, and a touch of orange zest. I was SO happy with the end result. 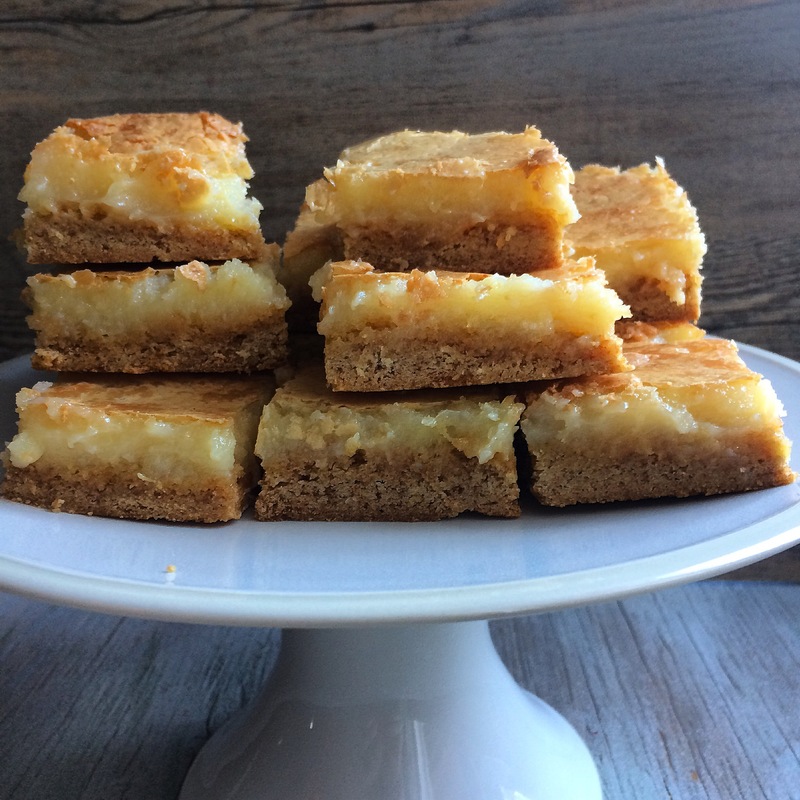 It turns out this classic sugar cookie recipe works great as a “slice and bake” cookie palette as well. For someone like me who will leave sugar cookie dough in the freezer for months just to avoid the task of rolling out the dough then decorating the cookies, this may be a much better way to go in the future. With this new take on sugar cookies, all you have to do is be patient waiting for the dough to chill, then you slice and bake and you are DONE! I wanted these cookies to feel somewhat festive, and I thought adding white chocolate, dried cranberries, candied ginger and orange zest was a good way to go. They are reminiscent of the “cranberry bliss” flavor that is popular this time of year. In the future, I’ll definitely be trying different flavors! two parts and mix thoroughly. Fold in the white chocolate chips, dried cranberries, candied ginger and orange zest. Divide the dough into two round logs and wrap each in wax paper. Refrigerate at least 1 hour. Remove and unwrap the dough, and with a sharp knife, slice cookies about 1/2 inch thick. Place cookies on a baking sheet lined with parchment paper. Bake the cookies at 400 degrees F for about 10-12 minutes. You never want them to get too browned around the edges, or they’ll be super crunchy. We like ours on the softer side. While my cookie decorating skills aren’t really getting any better with the sugar cookie of the month, I at least got to try out a fun experiment in altering the recipe: swapping out the sour cream for canned pumpkin. I’m happy to say…success! 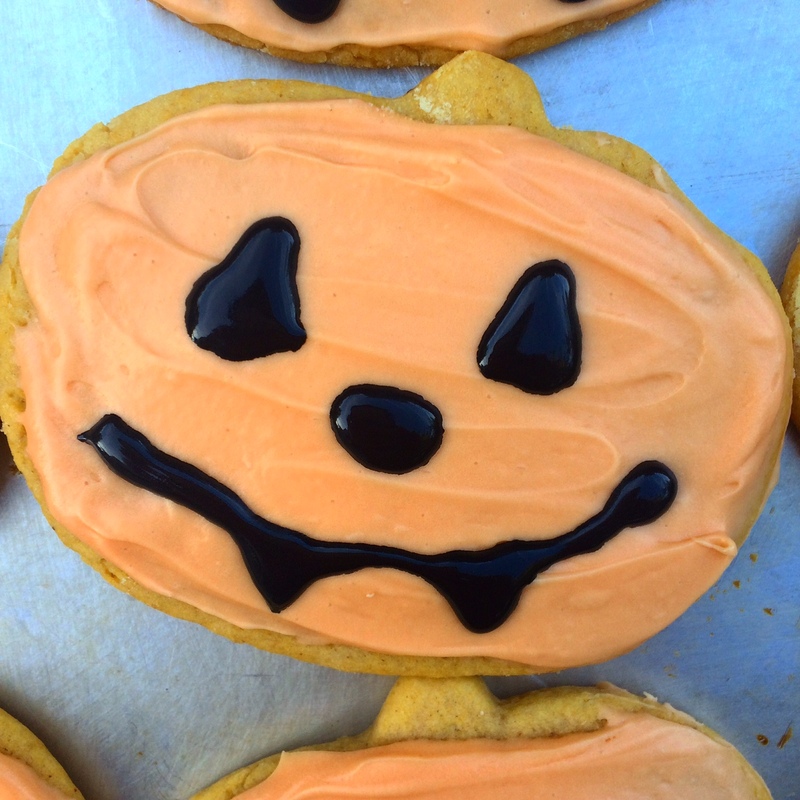 These cookies have a very subtle hint of pumpkin and fall flavors along with maple icing. 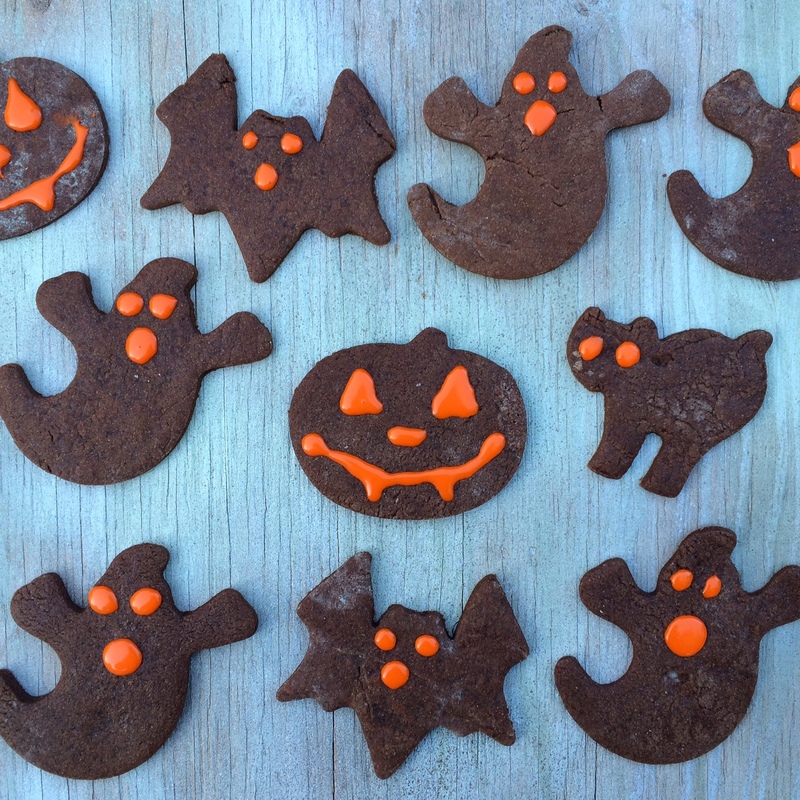 You can save these for Halloween, or skip the pumpkin shape and decorations altogether. As you know by now, I’d rather have a tasty cookie than a pretty one. Black tube frosting (we used store bought, and this is totally optional. If your decorating skills are like mine you may want to skip this). In a large stand mixer fitted with a paddle attachment, cream the butter and sugar. Add the egg and vanilla, mix thoroughly. Add pumpkin, mix thoroughly. Sift together flour, salt, soda, baking powder, nutmeg, and pumpkin pie spice. Add to butter mixture in two parts and mix thoroughly. On a clean, floured surface, roll out the dough with a rolling pin. Roll the dough so it’s about 1/4 – 1/2 inch thick, and use your favorite cookie cutters to cut out shapes of the dough. 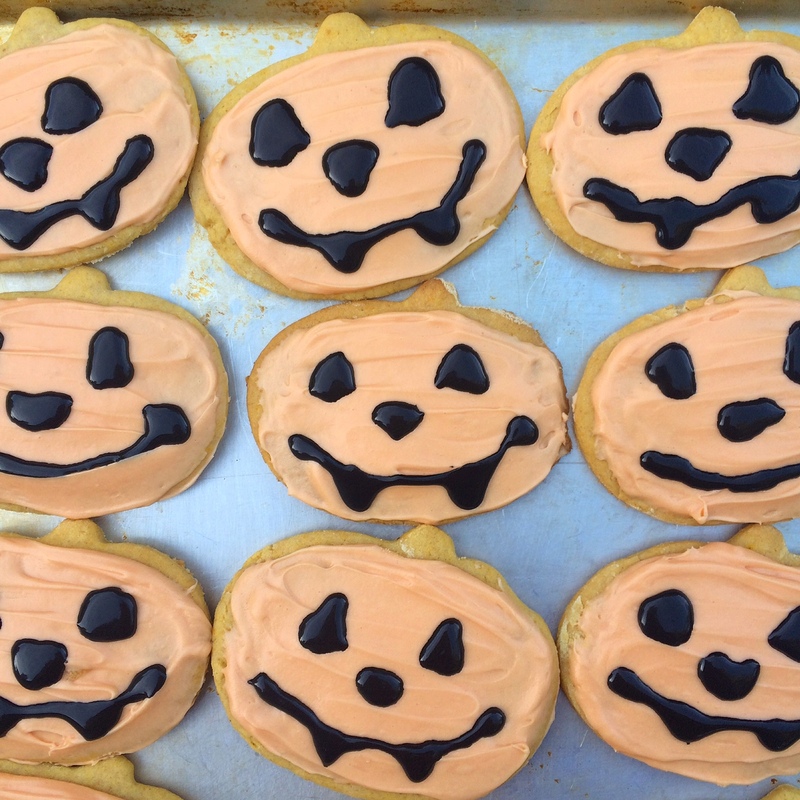 For these cookies, I used a pumpkin cookie cutter. Use a cookie spatula (better known as a pancake flipper) to move your cookies from the floured surface to a well greased baking sheet. Ungreased silicone baking sheet liners work great here too. Combine butter, salt, maple syrup, vanilla, and 1 cup of the powdered sugar. Add milk and remaining sugar, alternately. Mix until smooth & creamy. Add the food coloring to make the frosting orange, if using. Frost the cooled cookies. If desired, decorate the pumpkins with fun jack-o-lantern designs. We used store bought black frosting for this, and it’s totally optional. Cookies keep well in the fridge for a up to a week, a few days at room temperature. Enjoy!